Combat sports has been around since the beginning of recorded history. What compels someone to fight? While there is usually a prize, fighters are often searching for honor, glory, redemption, and pride. Kidder, Nancy. "Four Ways of Looking at Mayweather vs. McGregor." The Atlantic. 25 August 2017. Sangillo, Greg. “The Butterfly and the Bee: How Covering Combat Sports Can Improve Writing Skills.” American.edu. 18 March 2019. 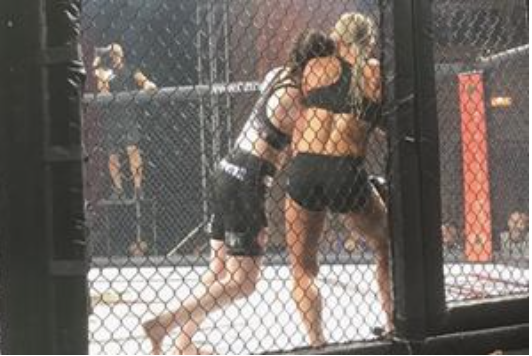 Lisa Spangler (left) defeated Shanna Young in the Invicta FC Bantamweight Division. Kansas City, Missouri, September 2018. Rosenblatt, Josh. "There's A Class At American University Where You Can Learn How to Write About Fighting." Fightland.vice.com, 30 March 2017. Kidder, Nancy. "Ronda Rousey Ready To Fight: What MMA Means For Women’s Sports." Feminine Collective. 18 December 2016.